The latest registered political party to contest the 2019 elections at the end of the year, the Landless People’s Movement, of the former Governor of the Kharas Region, member of parliament and former Deputy Minister of Lands and Resettlement, Bernardus Swartbooi, is facing a legality challenge to their registration list. 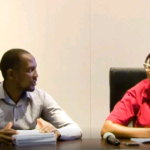 A group of individuals, amongst them, the SWAPO Deputy Minister of Industrialisation, Veikko Nekundi, launched a protest about what they termed ‘a gross violation of the electoral law’ and negligence by the Electoral Commission of Namibia (ECN). The group alleges that the ECN should have vetted the voters list and therefore would have picked up that deceased voters are listed, a duplication of at least 400 supporters with different names but the same voting card numbers and various other mistakes slipped through. Informanté reporter Samuel Shines Shinedima captured the video clip at the ECN Headquarters. It is expected that he LPM leader, Bernardus Swartbooi, will answer on this turn of events later on Monday at a planned news conference.